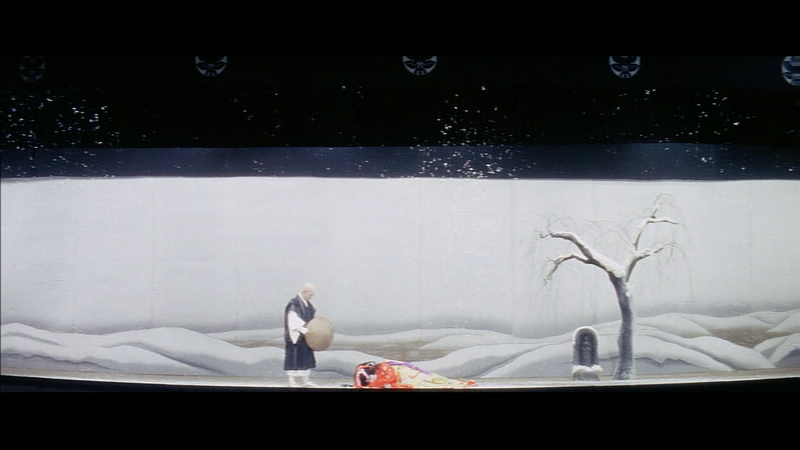 Released to celebrate the 300th role of iconic Japanese actor Kazuo Hasegawa, An Actor's Revenge (Yukinojo Henge, 雪之丞変化) is a superbly eclectic offering from director Kon Ichikawa (The Harp of Burma) - as surreal as it is stylized and mesmerizing cinema. Hasegawa plays the double-role of Yukinojo Nakamura - a kabuki actor who (like Hasegawa himself) was renowned for being an onnagata, or female impersonator - and the dashing thief Yamitaro, who likes to behaves a bit like Robin Hood. 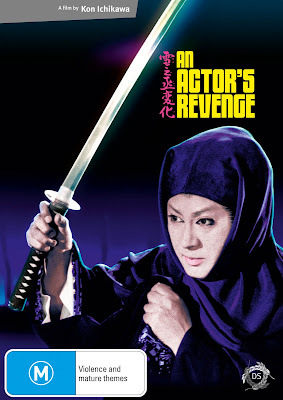 When Yukinojo chances across the three men who drove his parents to suicide decades earlier, he sets in motion a plan for revenge worthy of Shakespeare; what he discovers he can't control are the ulterior ramifications of this revenge-play, as his actions shatter innocent lives. 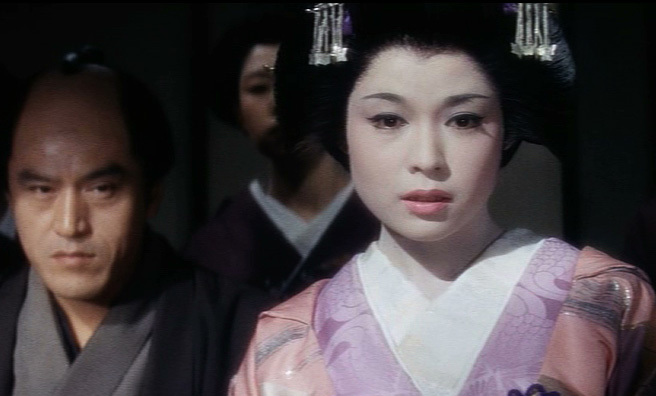 It's difficult to overcome the fact that lead man Hasegawa was pushing 55 here; while he was reprising a role he played before (in 1935), he's obviously too old to push the sensuality angle of the onnagata, yet still somehow tweaks it on several levels. 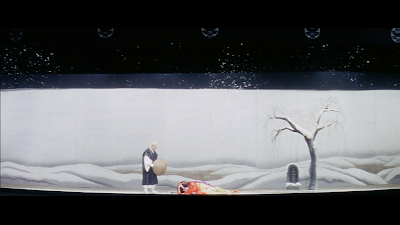 For his part director Ishikawa doesn't even try to suspend disbelief - into this high drama he winds liberal doses of comedy, kabuki-style sets and visuals that are stretched out within a pop art context, and some innovative sword-fighting moments that border on the dream-like. Realism this most certainly is not, and that's the film's beauty. 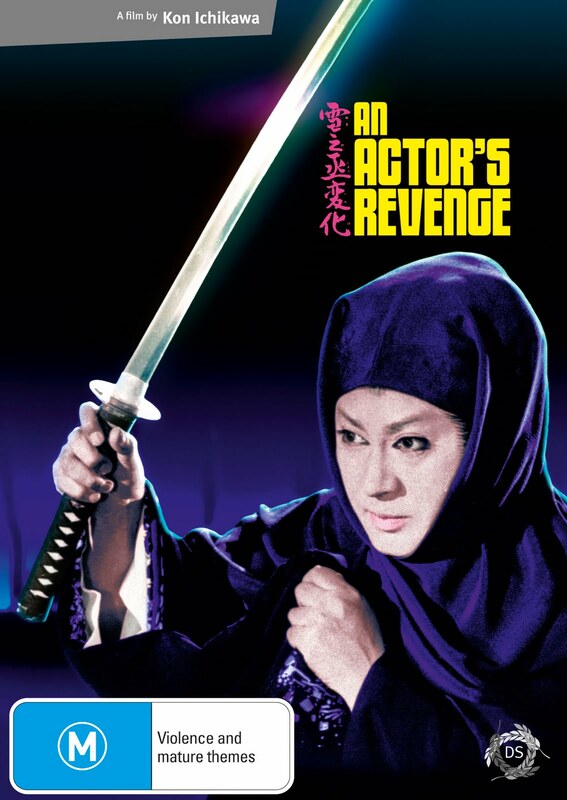 Adding to the spice in An Actor's Revenge is a modern jazz soundtrack, while the acting chops are ably supported by Shintaro Katsu (of Zatoichi fame) and the stunning Ayako Wakao, who previously shone as Eiko in Kenji Mizoguchi's The Geisha (1953), and is devastating here. While not Ishikawa's grandest achievement, it's still a hypnagogic gem well worth the viewing, and the cool cats at Madman Entertainment in Australia are going to be releasing this in July - check here for more details. Images © 1963 Kadokawa Pictures, inc. I've had this movie on dvd for a few years now and am still amazed by the skill of japanese directors and photographers.Great to watch and a very good yarn.Shame it has taken so long to be available here in Oz. Yeah, there're some insane Japanese gems out there, right? I had no idea about this one till I watched it. Wow.